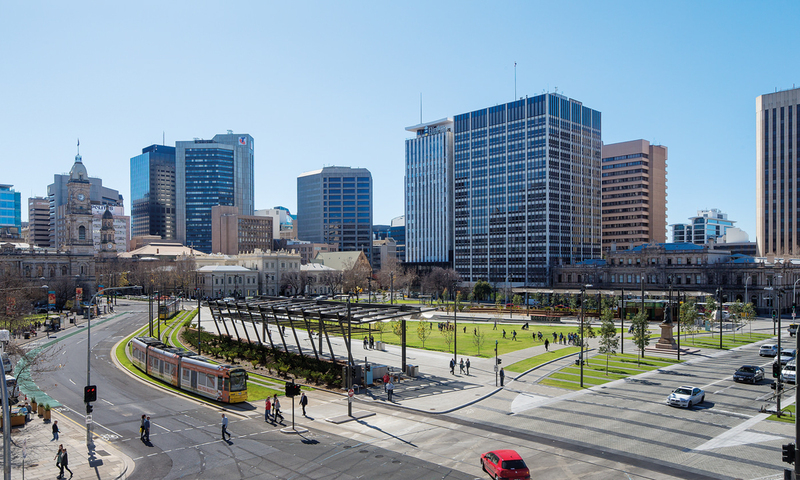 From its earliest days, the land that would become known as Tarntanyangga Victoria Square has been designed and re-designed to mirror the society surrounding it. For Tanya Court, the story of the ever-transformative Tarntanyangga landscaping holds within it one lesson that sticks out. 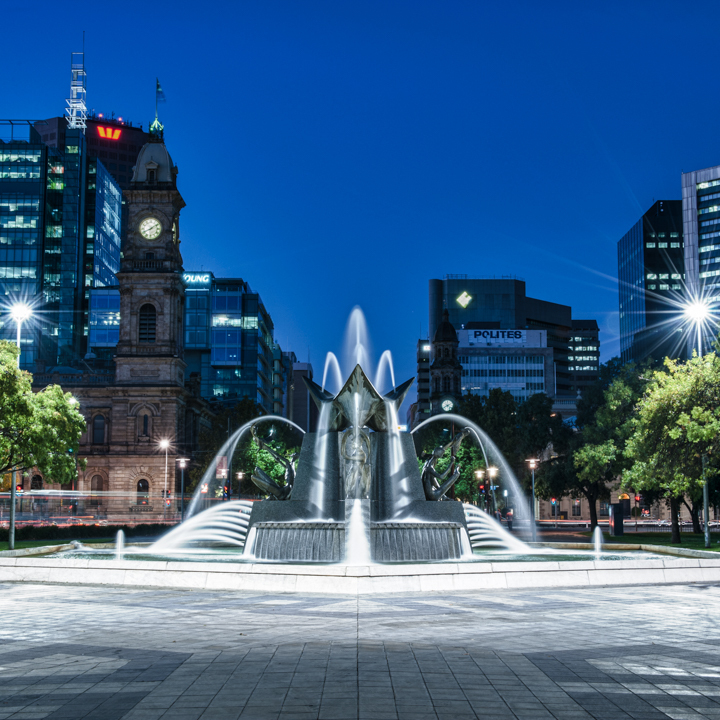 The Senior Lecturer and Co-ordinator of Landscape Architecture at the University of Adelaide says the city’s seemingly endless dissatisfaction with the Square points to a fatal flaw. “It’s just too big,” she says. “Compared to public squares in Europe – which are bounded by buildings and much more densely populated, it’s basically a big roundabout. If you’ve always wondered what Tarntanyangga means and never asked, read James Tylor’s article on the history of the city’s Kaurna place names here. One major problem is the integration of transport into the Square – people trying to use it are constantly thwarted by the arrival of the tram, or a flood of traffic through the central Wakefield-Grote Street road. Various post-colonisation designs have attempted to remedy this by alternating between roads that zip through the centre, then back to those that loop around the Square. Tram tracks have been given the same incorporated-then-isolated-then-incorporated-again treatment. What doesn’t change, though, says Tanya, is what each redesign is trying to achieve. Victoria Square, as you know it. CityMag also constructed a Tarntanyangga timeline from our research. Scroll to the end of the article for a condensed history of the square. While the need to gather may be ubiquitous and timeless, Tarntanyangga’s history is also a lesson in how the right to gather and use public space is not extended equally. From the plantings to the fencing to the laws that apply there, the Square’s design has not always made all welcome. “You could say the naming of the Square and all the tokenistic gestures toward the Kaurna connection there don’t really do the job they say they do,” says Tanya. “The vegetation – there was a big argument about whether it should be plane trees or eucalyptus and there are some eucalyptus now, but there’s plane trees still there. And Queen Victoria – she still sits in the middle and that is a colonial act. “The second stage of the TCL redesign – that was the stage that included many Indigenous cultural elements, and that is the stage that didn’t get funded. The land becomes home to the Kaurna First Nation. They call the region Tarntanyangga in acknowledgement of the Red Kangaroo Dreaming ancestor and the yellow rock found between the river and the square. Skilled land management over millenia results in the Kaurna lands becoming an open grassy plain dotted with patches of shrubs and trees. The site that would become Victoria Square is of immense significance – it was near the main settlement of the Tarntanya clan and a gathering place of ritual and spiritual importance. Colonisation has already begun to affect the Kaurna people, but when Colonel William Light begins implementing his plan for Adelaide in 1836 parcels of land are sold and they are forcibly dispossessed of their land. The central city square is marked out during this era, but the site is largely left untouched. Adelaide’s Street Naming Committee decide to name the Square after Princess Victoria. The first landscaping is done in the Square. 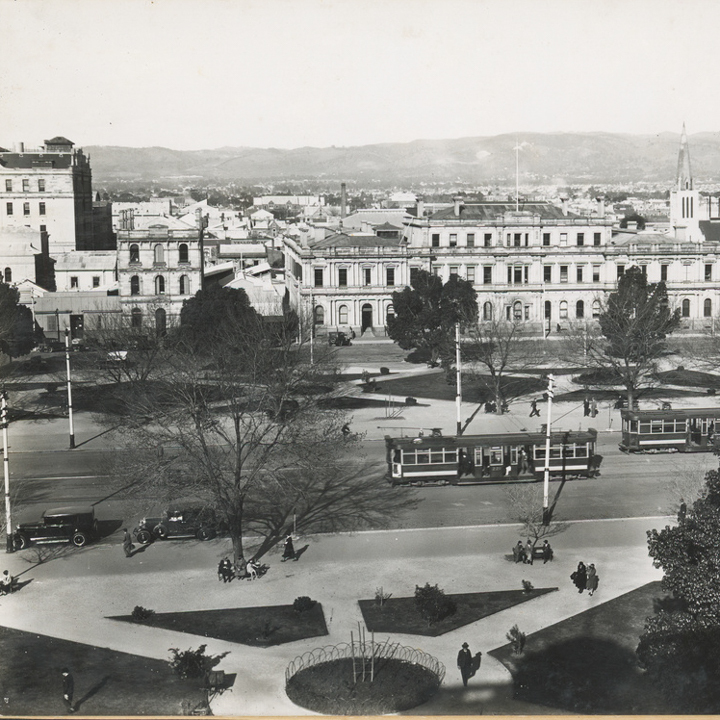 George Francis – who went on to become the first director of the Adelaide Botanical Garden – plants 3,000 acacia, almond, olive, gum, poplar and cypress trees in Victoria Square. 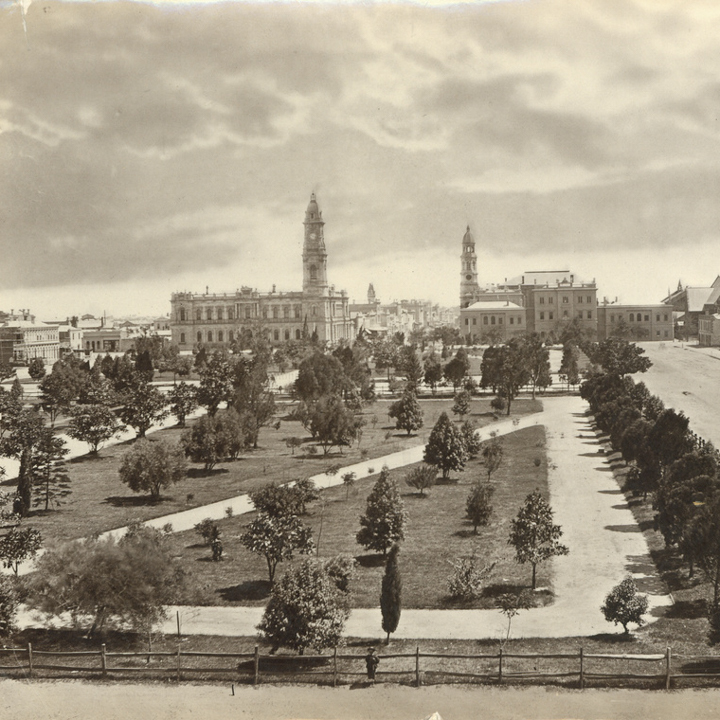 William O’Brien, the City Gardener, replants Victoria Square with ornamental trees including Norfolk Island pines, Moreton Bay figs, white cedars, kurrajongs and cassia trees. He also introduces gravelled paths. A new city gardener, August Wilhelm Pelzer is appointed. Over his multi-decade tenure, he removes a vast number of trees from Victoria Square, creates formal geometric lawns, and takes various measures – from fences to paved paths – to discourage people from walking on the grass. During WWII, trenches and pipe shelters are dug into the Square to serve as air raid protection in the event of an attack on Adelaide. After the War, the Square is left looking worse for wear. Three Rivers by John Dowie. A redesign first mooted in 1965 is completed. It includes the centrally placed Three Rivers fountain created by artist John Dowie. Immediately upon completion of the redevelopment, debate breaks out again about how the Square needs to change. 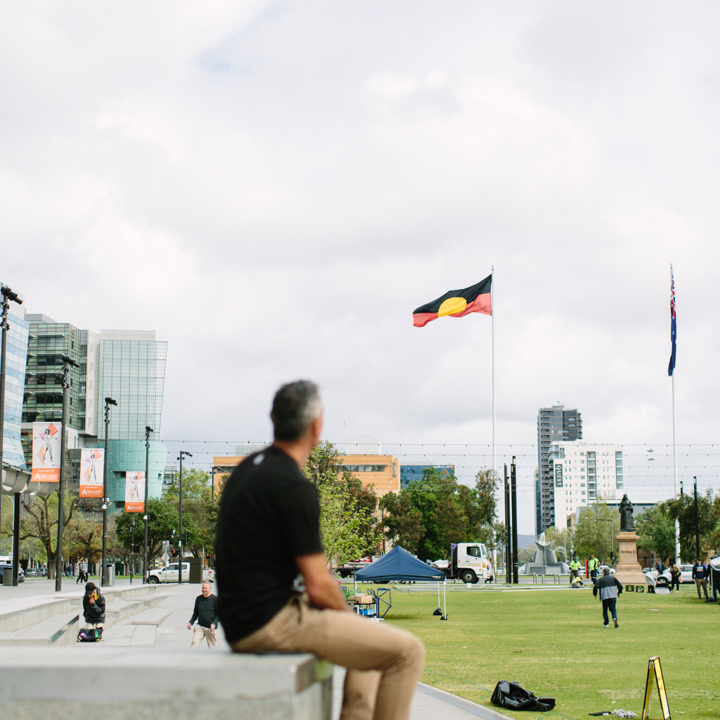 The Australian Aboriginal Flag, designed by Harold Thomas, is flown for the first time ever as part of NAIDOC celebrations that take place in Victoria Square on 12 July. 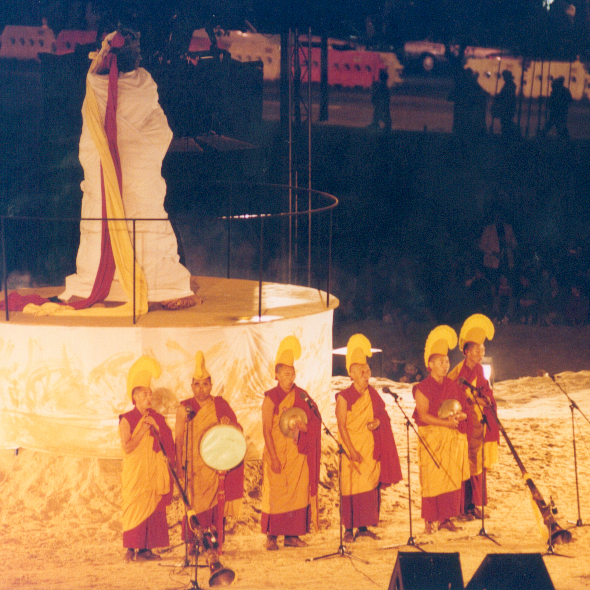 Victoria Square is the site of the Adelaide Festival of Arts Opening Ceremony. The event, called Kaurna Palti Meyunna, is created by associate directors Karl Telfer and Waiata Telfer and brings Indigenous peoples from around the world together to share their stories with each other and an Adelaide audience through performance. 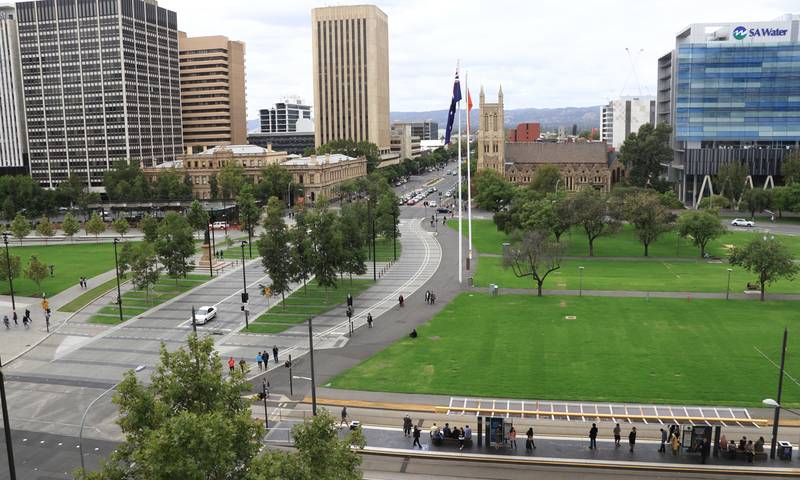 The City of Adelaide recognises the site’s Kaurna history and present by giving it the name Tarntanyangga. After decades of debate, the City Council commits to a major renovation of Tarntanyangga and allocates $24 million. The first stage of the redevelopment is completed in accordance with designs by a collaborative team led by Taylor Cullity Lethlean (TCL). The changes include the introduction of space for large events, shelters, a central plaza, and seating infrastructure that is also used extensively for skateboarding. The second stage of the redevelopment planned by TCL remains incomplete. These plans include important elements such as a Kaurna Centre of Culture and a productive garden featuring native foods.